GUIDE DOGS are trained dogs that provide easier traveling for visually impaired people. 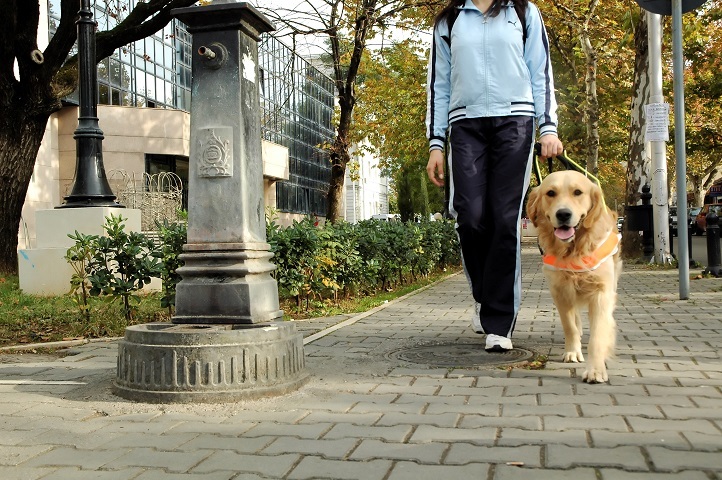 It takes 8 months to train a guide dog and the training involves obedience, indicating the curbs, steps, avoiding obstacles, finding road crossings, bus and tram stops, navigating in traffic, etc. 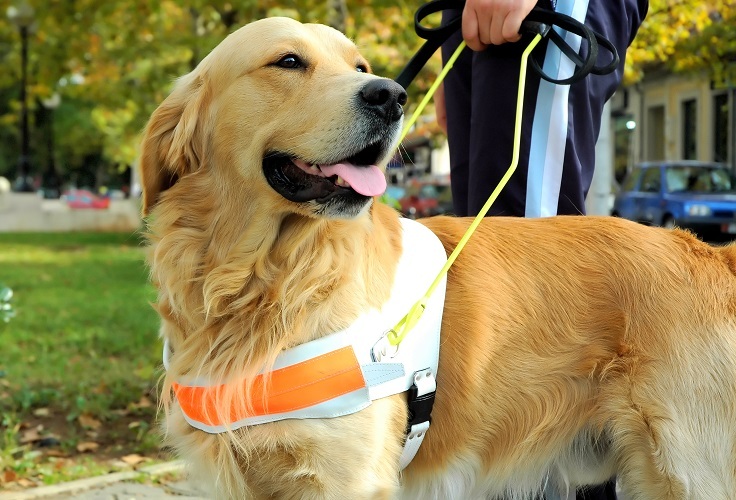 Apart from learning the commands, a dog has to know how to find the most secure and the most appropriate solutions in numerous situations, in order to enhance the independence, security and traveling speed of a visually impaired person. In the last stage of training, instructors work blindfolded so that their movements could resemble most the movements of a blind person and also, to avoid the eye contact with the dog. The training programme includes and initial assessment to select the most appropriate dog regarding its temperamental and working abilities, for an individual client. The matching and training the dogs with their new owners is done individually with each client, and it takes 6 weeks (5 weeks in Silver Centre and a week at the place of residence of the client). During the training a blind person builds up their bonding with the dog, gets basic knowledge on dog care and health and learns the commands that the dog learned during its training. After the end of training the expert committee of the Centre together with a representative of the Croatian Guide Dog and Mobility Association does the assessment of traveling coordination and communication between the dog and its owner, which is the precondition for safe and quality travel of a visually impaired person with a guide dog. The establishing of routes at the place of residence of the client follows after mastering of programme in the Centre, and the assessment of the work unit.A person must have good orientation, knowledge of walking routes and ability to estimate the traffic when Apart from the safety and quality of travel, traveling with a guide dog has an impact on breaking the barriers that normally prevent social community to recognize the abilities of visually impaired persons.traveling with a guide dog, while the dog’s task is to find the safest travel solution. The average working life of a guide dog with a client is 7 to 8 years. The exact time for retirement of each dog depends on the assessment of the guide dog unit by a team of experts. Please, do not ever disturb a guide dog when it is working because you can distract its concentration and jeopardize the life of a blind person.